FOXBORO, Mass. – Even though the game ended in a 1-1 tie, and both sides walked away with a point, there was a reason that Canton had more to celebrate. The tie clinches the Bulldogs at least a share in the Davenport division title – the program’s first Hock title since 2013 – and a chance to win it outright with a win or tie against Stoughton night on Wednesday. Although Foxboro is mathematically still alive for a share of the title, the Warriors would need to beat North Attleboro and a win from the Black Knights over Canton. If the Warriors had picked up a win over visiting Canton on Monday, the two teams would be tied for first heading into the final game. “It kind of feels like a loss because they played so well and gave so much effort that you want the win,” said Foxboro head coach Melissa Bordieri. “But we’re putting ourselves in a good position to compete in the tournament, which is always next level hockey. 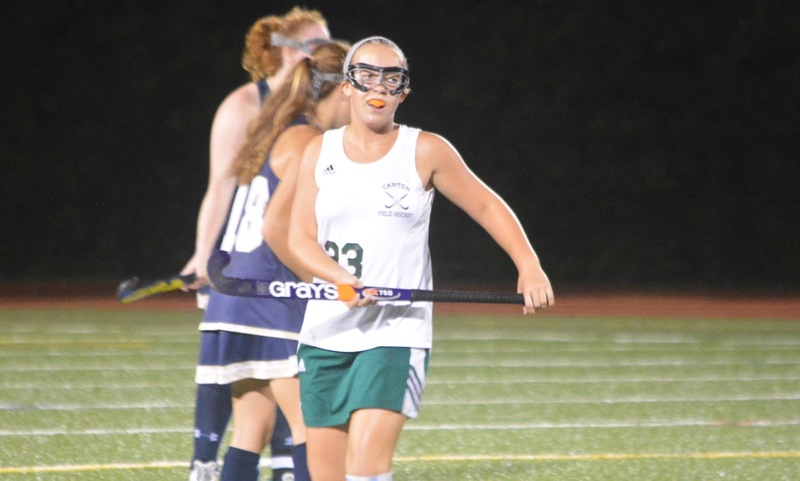 Despite being of the two top scoring squads in the Hockomock League, the two teams showed off why they are two of the stingiest in terms of goals against in the first half. Foxboro had the lone shot on net in the opening five minutes but Riley Brown turned away Sophia DiCenso’s bid. Just minutes later, Foxboro got the ball behind the Canton defense but Brown came charging out and kicked it clear. Canton had the lone two corners of the first half. The first, with just over 13 minutes left in the opening stanza, was denied when Foxboro’s defense was quick to get out and clear it out. The second came with just over a minute to play, but once again Foxboro’s players were quick off the line and thwarted any chance before Canton could get a shot off. After a pedestrian first half, the second half started with a flurry of chances. Foxboro had three straight corner chances in the opening minutes. The first two chances each resulted in a shot, but neither found the back of the cage. But on the third attempt, the ball popped out of a scrum in front. Junior Carly Stern placed a shot on net and just beat the diving effort of Brown to give Foxboro a 1-0 lead. 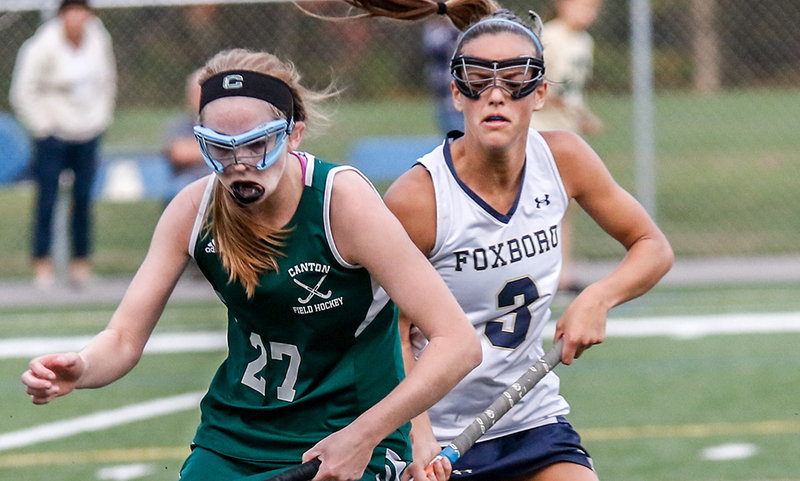 Foxboro’s defense limited the visiting Bulldogs to just one corner in the second half, and one shot on goal, but Canton made the most of its chance. While in the attacking end, Foxboro was whistled for a foot infraction. Canton sophomore Kaitlyn Goyetch quickly took the restart, sending the ball into the circle where senior Andrea McNeil got a perfect touch, tipping it past the outstretched effort of Foxboro’s Kelli McCarthy. “I think the girls were thinking about the Davenport (title) in the first half and sometimes that stresses you out,” O’Connor said. “But we just told them to stay composed and play their game. And they were able to pull it back together. Foxboro’s best chance to regain the lead came with just over 13 minutes to play. Off of Lily Daly’s corner, Jackie Brion stopped the pass and Catherine Luciano unleashed a shot. DiCenso got a tip in traffic but the ball bounced off the post and stayed out. The Warriors had seven corners in the second half alone, but Canton’s defense did well to prevent any other goals. Canton field hockey (13-3-1 overall, 12-2-1 Hockomock) can clinch the Davenport title outright with either a win or tie against Stoughton on Wednesday at 6:30. Foxboro (12-3-1, 11-3-1) concludes its league schedule by hosting North Attleboro on Wednesday. Foxboro, Mass. – After struggling to get going on offense in the season opener against King Philip, defending Davenport division and Div. 2 South champion Foxboro clicked into gear and found its scoring touch against Franklin on Monday evening at Sam Berns Community Field. 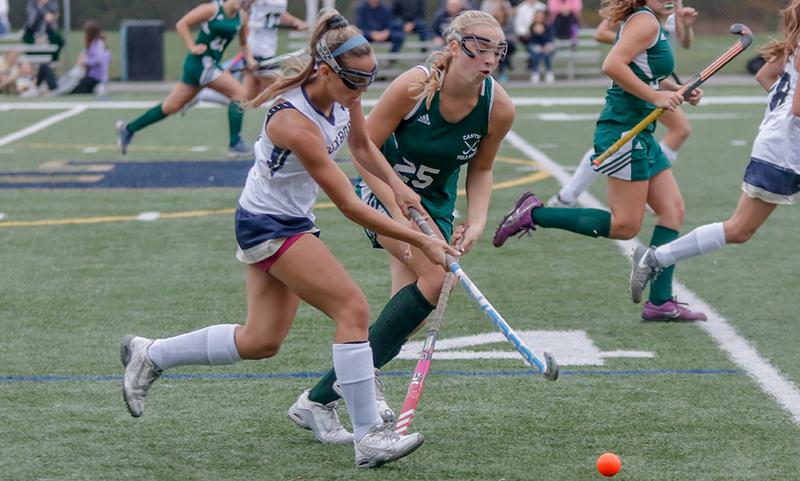 Junior Lily Daly scored a pair of goals and classmate Sophia DiCenso had a goal and two assists, as Foxboro pulled out a 3-1 victory over the defending Kelley-Rex division champions. The game started evenly with both teams racing through the midfield and trading attacks, although there were few clear chances in the opening 20 minutes. Annie Walsh had a one-timer hit the outside of the goal and then a minute later Julia Carangelo had a shot from distance kicked aside by Franklin goalie Christina Luccini. In the 20th minute, Foxboro found a breakthrough with a quick break. DiCenso sent a pass in front and Daly slipped the ball past a few Franklin defenders and just past the line to make it 1-0. Just a minute later, the Warriors doubled the lead. Daly created the opportunity with a run down the left wing and she hustled to keep the ball in play before cutting it back to Catherine Luciano. The senior crossed the ball into the middle for DiCenso, who finished with a first-time shot on the turn. 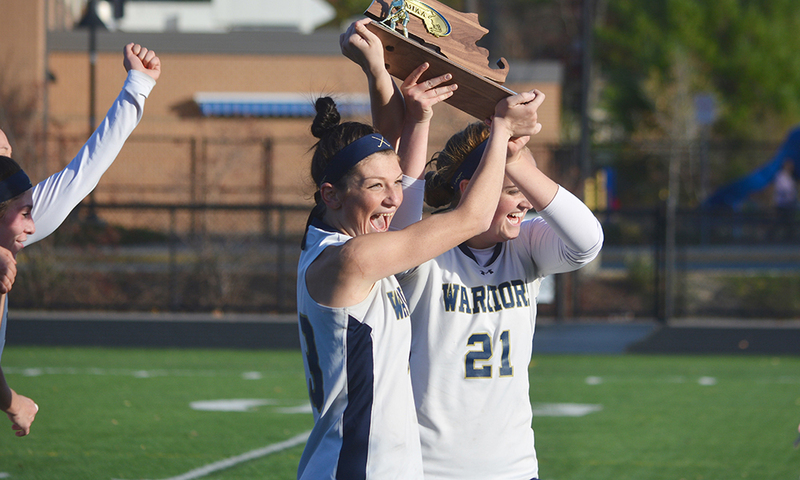 Walsh had the first chance for Franklin in the second half but her shot was kicked aside by Foxboro goalie Kelli McCarthy, last year’s league MVP, which was only one of two shots on goal by the Panthers. Four minutes later and Foxboro added a third. This time it was a run down the right wing that opened up the Franklin defense, which was missing senior center back Kate Morse to an injury. Junior Molly Murphy, who last week verbally committed to play lacrosse at Davidson, found space on the right to center to DiCenso. The ball bounced in the crease and Daly popped up at the back post to knock it home for her second of the day. With seven minutes to go, Franklin got on the board. Walsh again beat her defender to open space and was able to pull the pass back to Cassi Ronan. The junior midfielder then flicked a pass into the middle and freshman Victoria Quinn batted the shot into the back of the net for her second goal of the season. It was the rare chance that Franklin was able to create against the Foxboro defense, thanks in large part to the play of senior midfielder Jackie Brion, who seemed to be in the way of every Panthers attack. Foxboro (1-1) will face Sharon on Thursday and Hopkinton a day later. Franklin will try to bounce back against Oliver Ames on Wednesday. FOXBORO, Mass. – Foxboro won the final draw control of the game and charged down the field. But with just under 10 seconds remaining, there wasn’t enough time to set a up a play. Instead, time ran out just before the Warriors could release their final shot. If there was another second left, Foxboro might’ve scored its seventh goal of the half and completed a stunning comeback. Instead the clocked hit double zeros and Franklin recorded its second straight one goal victory, 9-8, over Foxboro in a battle of division leaders. The win clinched at least a share of the Kelley-Rex title for Franklin — the sixth straight for the Panthers. Foxboro’s Molly Murphy cut the deficit to just one with 11 seconds to play, but Foxboro couldn’t get a shot off to tie the game before the buzzer. Similar to its victory over defending state champions Westwood on Monday, Franklin relied on its defense and clung to its lead. When the division champions battled a year ago, Franklin handled Foxboro 13-8 — and this year’s game began in similar fashion. Senior Caroline Lounsbury scored the first two goals for Franklin on feeds from freshman Erin Walsh. The senior attack caught both feeds at full speed, cut towards the net and finished to the left of Foxboro goalkeeper Sara Addeche. A mishap in front of the net led to an own goal for Foxboro, giving the Kelley-Rex leading Panthers an early three goal advantage. But after that, Foxboro’s defense settled in. The Warriors’ zone stifled the Panthers over the last 35 minutes allowing just six goals to a Franklin team which had previously been held to single digit scoring just four times this season. Addeche compiled 10 saves while her counterpart, Franklin freshman Gianna Cameron, tallied eight. After trailing 5-2 at the half, Foxboro dictated pace in the second half. The possessions lengthened from barely half a minute in the first half to nearly two minutes per possession in the second half. The Warriors’ offense was patient and waited for opportunities to arise. Jackie Brion scooped a ground ball and cleared it the length of the field. She moved the ball on to Meghan Curran, who scored twice in the first half, as the sophomore was cutting down the alley. An additional pass reached Lauren Flahive before the senior fired it into the back of the net. “If we played like we did in the second half in the first half I think we would’ve gotten a different result,” Sherry said. In the few possessions, Franklin did capitalize. The Walsh sisters, Annie a sophomore, and Erin a freshman, combined for three of the last four goals of the games for Franklin. On the team’s second to last goal, Annie stood outside the circle of Warrior defenders and carefully lobbed the pass over their heads. The ball landed perfectly in a streaking Erin’s stick and the freshman cranked the shot just under the crossbar. A few possessions later Lauren Bissanti ran from the bench straight through the Foxboro defense and caught a pass on the run down the center of the defense. She sent the eventual game winner to the bottom left corner. 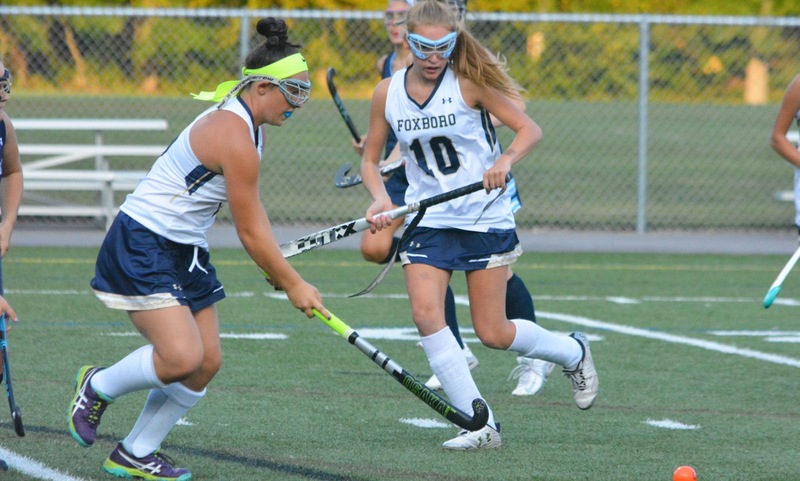 Foxboro would make a late push with goals by Sophia DiCenso and Murphy, but it wasn’t enough and Franklin remained unbeaten in league play. Franklin (17-1 overall, 8-0 Hockomock) will look to clinch the Kelley-Rex title outright when it travels to Taunton on Thursday. Foxboro (13-3, 8-1) will look to bounce back on Friday with a trip to Attleboro.